Remember back to the warm, sunny days of August… You there yet? 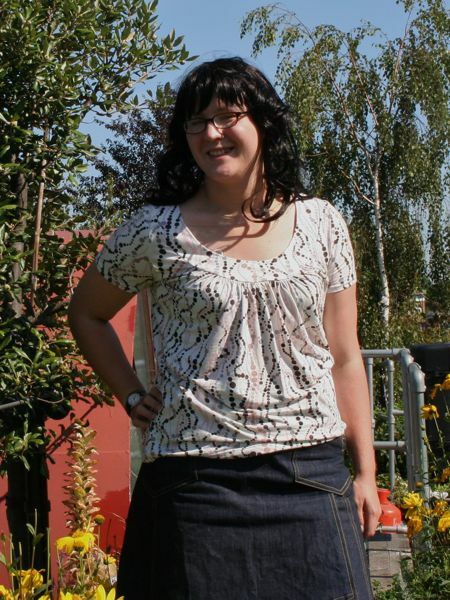 Because that’s when I sewed up this top, in between the dresses I made for my mom while she was visiting! 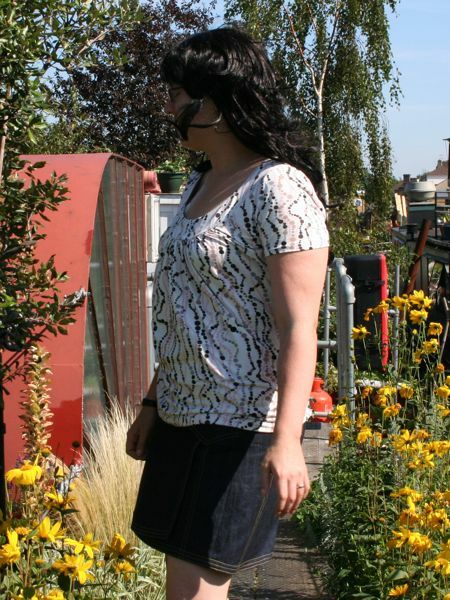 I’d bought the Hot Patterns Weekender Sunshine Top pattern almost two years ago, but I’ve had such a hit & miss experience with their patterns that I never quite worked up the nerve to sew this one. But with review after glowing review appearing on PR, I finally had to take the plunge and make my own, especially since it seemed quite a forgiving style for my hospital- and medication-induced chubbiness. 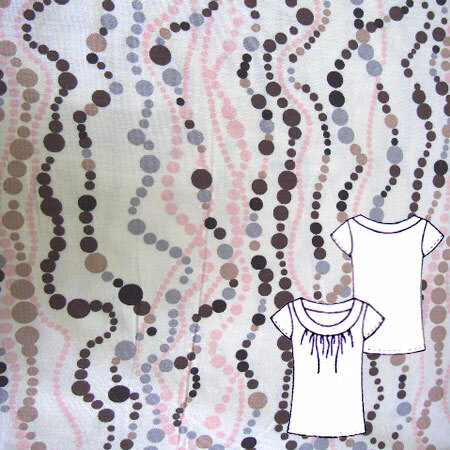 This cotton/lycra knit fabric from Totally Fabrics is so lush and soft that I’ve actually held off posting this so I could buy some more before you all snapped it up (but alas, it sold out just before they posted another site-wide sale)! I got this on sale, so the 1 metre I used here was only £3.75! 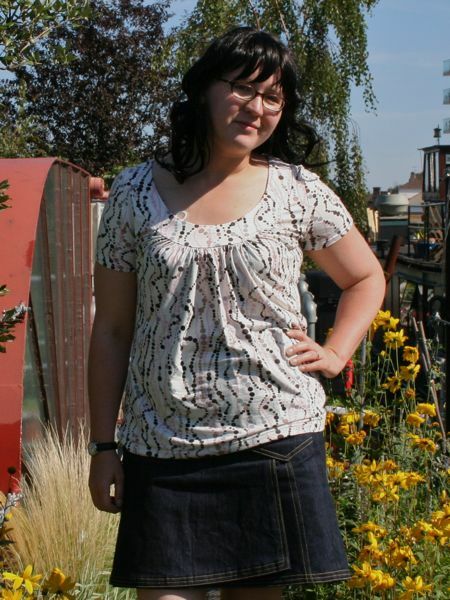 I’m definitely going to make more of these Sunshine Tops – I can totally understand why the pattern is so popular! 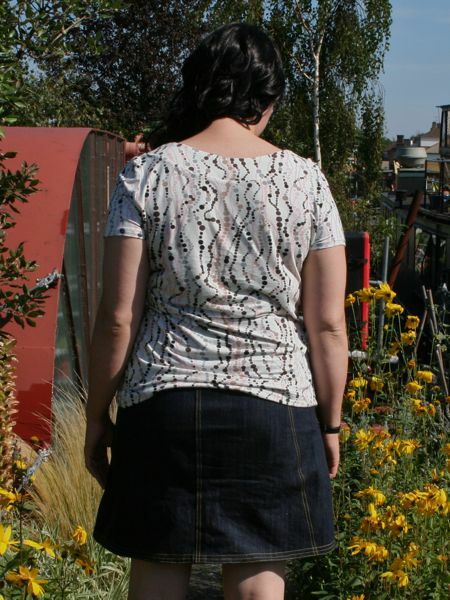 It’s just so easy to wear, and really easy to sew together, too (almost criminally easy if you’ve got an overlocker and a coverstitch)! The only thing I didn’t like about this is that the sleeves are definitely on the tight side, which seems odd considering how generously sized the rest of the top is. As luck would have it, I even had a bit of fabric leftover and I loved it too much to see it go to waste, so I made a pair of pants! I used some white FOE (from Sigrid originally I think!) along the waistband, the very last of my brown satin-edge plush elastic from my elingeria.de bra kit around the legs, and a cute pink bow and pearl that Naaipatronen.nl threw in for free last time I ordered. Just making these on a whim (using my favourite KnipMode thong pattern!) got me seriously bitten with the lingerie bug again so I’m totally eyeing up the lingerie pack Sigrid bought me for my birthday. I’d forgotten just how much fun smalls can be! I’ve worn these so much since August (even more than the shirt, funnily enough) and they’re just SO comfortable! Separator image Posted in Gallery and tagged with hot-patterns, knit, lingerie, top.